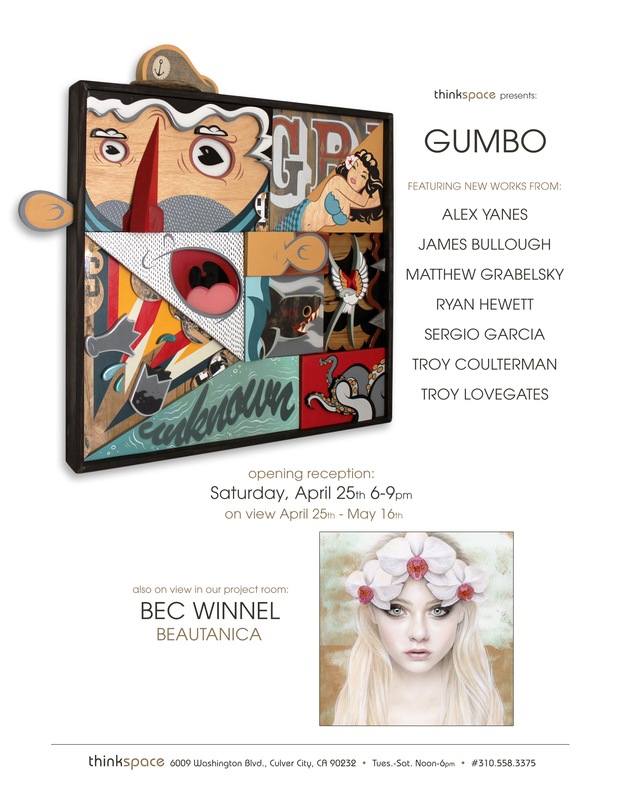 Thinkspace (Los Angeles, CA) – is pleased to present Gumbo, a group exhibition featuring works by Alex Yanes, James Bullough, Matthew Grabelsky, Ryan Hewett, Sergio Garcia, Troy Coulterman and Troy Lovegates. A truly divergent group of Thinkspace artists, the show reflects the steadily expanding diversity of the gallery’s roster. Firmly forward-looking, while ambitiously setting the pace for the New Contemporary movement, these artists have phenomenal contributions to make and are consistently raising the standard. Gumbo is an exciting grouping of the gallery’s contrasting visions, personalities and media. Alex Yanes creates whimsical multi-dimensional works, inspired by everything from subculture to his recent initiation into fatherhood. Based out of Miami, a vibrant urban culture that sings through his aesthetic, Yanes creates installation based pieces out of wood, acrylic, resin and enamel. With hyper-saturated colors and contrasts, immaculately finished surfaces and electric energy, Yanes’ spatial installations and objects command a physical and experiential presence. They combine a graphic sensibility, drawn from his formative years immersed in tattoo, rock, hip-hop and skateboard cultures, and an imaginative expansiveness that transforms the familiar into something entirely new. Elevated by an undeniable vibrance and individuality, his stylized works feel like living things. Matthew Grabelsky’s implausible, and wonderfully fantastic, paintings depict surreal manifestations of the subconscious in unlikely urban contexts. Influenced by 19th century French Academic painting, his technical sophistication and refinement contribute to the delightful contrast of these unlikely scenes and humorous mixed-reality paintings. In his recent body of work the New York City subways are invaded by quasi-mythical creatures, part human and part beast, or surreal appearances by other wonderful grotesques. In these otherwise unassuming daily scenes of public transit, Grabelsky inserts a cast of characters borrowed from fairytale and the zoo, delighting in the absurd and the impossible. Intending his work to inspire sub-conscious free association in his viewers, Grabelsky plays with context and expectation. Ryan Hewett approaches portraiture with an expressive and painterly aesthetic. Pursuing the capture of energy rather than the practice of verisimilitude, the South African artist has a distinctive painting style that seizes the energy and observed experience of his sitters. With loosely layered surfaces that emanate depth, light and dimension, Hewett creates emotive and passionate representations that embrace the materiality and texture of his medium. Working with oil paints, his figurative impressions align themselves with the tumultuous tradition of expressionism. With rich hues and suggestive glimpses, his works are intense painterly interpretations of the body. Texas based artist Sergio Garcia is inspired by the unconventional and the creative subconscious. A painter and a sculptor, his works are surreal combinations that place familiar situations and objects in extraordinary circumstances. A Hyperrealist in the truest sense, his sculptural works are uncannily true to life and play with the viewer’s spatial and contextual expectations. Wonderfully bizarre, they transform the mundane into fantastic phenomena, and encourage mind-boggling encounters in unexpected spaces. Similarly, his paintings offer whimsically unexpected combinations and creatively evocative scenes, inspiring free association and speculative wonder. Canadian artist Troy Coulterman creates resin sculptures that seem like graphic novel or comic book characters come to life. Rich with suggestion, Coulterman artfully conveys ideas, metaphors and themes with graphic concision, capturing extensive narrative moments in a single sculptural body or gesture. Inspired by graphics and comic books, his cast of wonderfully bizarre characters emote and convey with exciting presence. As three-dimensional objects that read partly as animation come to life, and partly as dimensional drawing, they command our attention with an unrelenting pull. Distinctly human in their emotive power, but clearly other in their wonderful absurdity, his figures are captivating. Troy Lovegates, widely known as “Other”, creates ambitious large-scale mural works with precision and detail. A street artist from Canada, his works are heavily patterned, saturated with hyper color, and incomparably dense and rich. With an impressive attention to detail and line, Lovegates builds figures and motifs through heavily condensed mark making. The figures in his work are wonderfully exaggerated and poetic, sympathetically drawn from equal parts caricature and realistic observation. His smaller format works are executed in several materials, ranging from weathered wood, books, paper and linoleum cuts. Self-described as an artist who enjoys the chaos of simultaneity and messy working conditions, Lovegates is constantly revising and adapting previous efforts, reintegrating them into current bodies of work that reflect the history of their making.